The Sullivan Estate is a private holding and extensive wellness spa set on five acres overlooking the entire North Shore of Oahu. The property is the personal residence, spa retreat, and skin care lab of Dr. Jurgen Klein, founder of Jurliqe, JK7 and a worldwide leader in high-end skincare products and wellness therapies. Multiple structures provide a wide range of use and can accommodate guests, therapists and support staff. Mature, park-like landscaping is throughout the property, which begins on the Pupukea plateau and cascades down to the sea-level plains below. The location is well out of the tsunami inundation zone, yet allows quick access to the North Shore's world-renown surf breaks known as the seven-mile miracle. 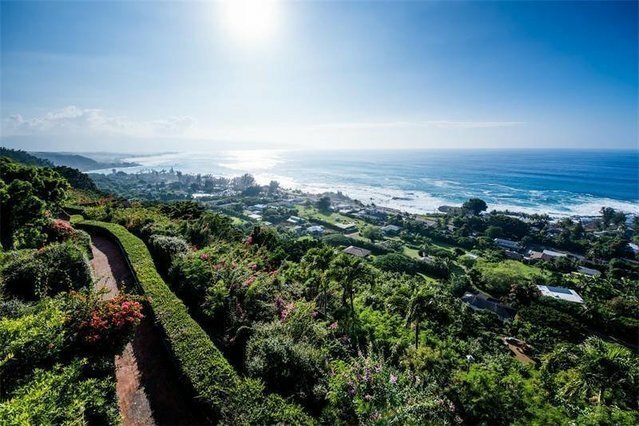 Sullivan Estate overlooks 15 miles of Oahu's famed North Shore coastline, from the surf breaks immediately below at spots like Waimea Bay, to the mountain ranges of West Oahu and Kaena Point in the distance. Here, there is privacy, yet easy access to the heart of the North Shore, Haleiwa town and Turtle Bay Resort. Honolulu is only a 50-minute drive away. In winter Humpback whales migrate and breach offshore. The view is truly expansive. No two sunsets are alike, and Tradewinds keep the temperatures naturally cool. The estate was built in 1962 by prominent Hawaii businessman, entrepreneur and founder of the Foodland supermarket chain, Maurice J. " Sully" Sullivan. Numerous celebrities have vacationed at the private estate, including Elvis Presley, Bono, Lionel Ritchie, and Owen Wilson, to name a few. The location has proven to be secure, enduring, and a true escape from the surrounding bustle of the North Shore and Oahu. Sullivan Estate is unlike others Hawaii properties. Numerous pods and structures can adapt to many use-cases. Dr. Klein has done extensive remodelling and restoring of the estate including making the entire complex off the grid. It easily shifts from a spa-retreat format to one where multiple guests could stay in total privacy. Pools, walkways, and private areas connect the many buildings. The Klein's currently have their JK7 Skincare business based here and a day-spa and wellness business, with therapists and spa clients from all over the world. Zoning would allow for other possible similar uses of the property. Subdivision is also a possibility.